This particular review has been a long time coming. Bit by bit over the past couple of months I've been reading Whole Foods To Thrive: Nutrient-Dense, Plant-Based Recipes for Peak Health , by Ironman triathlete Brendan Brazier. It's not a difficult read, though dense with interesting information. Last year's Whole Foods To Thrive follows up on Brazier's book The Thrive Diet: The Whole Food Way to Losing Weight, Reducing Stress, and Staying Healthy for Life, published in 2007. It's a treatise on why a plant-based diet is healthier for people (including athletes) as well as the planet, as well as being a resource on nutrition & a cookbook too. The first part builds his argument against eating animal products with facts & copious statistics. Though I found most of it engaging, I think the book struggles a bit when trying to explain how much CO2 is produced from producing meat by comparing it to driving huge distances. This still doesn't really make climate change tangible, in my opinion. I'm also not sure where he gets his concept of the 'healthy American diet' from--I'm not sure the average healthy eater actually eats meat three times a day. Brazier's focus on nutrient density really jives with what I've learned while researching baby food & feeding Sprout. He looks at the environmental toll of various food production/processing methods & assesses food using a nutrient to resource ratio. He advocates for veganism because of the inefficiency of meat in terms of water, fuel, land used & pollution generated as well as considering the micronutrients & calories in it. I think this is a really valid point & a great way to decide what's really healthy for us & the planet. However, I find it a bit disingenuous for him to focus so much on the environmental impact of food production while freely admitting that he travels all over the world constantly. There is some useful info on particular 'superfoods' as well as a section with 200 recipes follows this. We tried a few & like them. Though I know Brazier hopes his to convince his readers that becoming vegan is a healthier & more planet-friendly way to live, I still like to eat cheese & meat. This book did make me really think about the impact that my animal product consumption has on the world, however, so I think I may endeavor to eat less meat in particular. If you're looking to green your diet this book is a good resource. For those out there with food allergies & intolerances, the plant-based recipes in the last section are all allergen-free & contain no wheat, yeast, gluten, soy, dairy or corn. I think I'll keep it in rotation to add a few healthy meat-free meals into our diet every week. 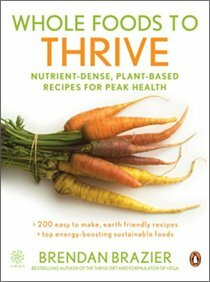 Whole Foods To Thrive: Nutrient-Dense, Plant-Based Recipes for Peak Health is available online or in bookstores, as a paper book or in ebook format.